“Organs-on-chip” developed by a USC researcher may mean a new testing ground for new drugs; a JILA research team finds first direct evidence of ‘spin symmetry’ in atoms, giving clues about electrical flow. Megan McCain, a USC Viterbi assistant professor in biomedical engineering is a self proclaimed cardiac tissue engineer. She is working to re-create the human heart on a chip. Not the kind of chip that leads to arterial plaque, of course, but the kind that perfectly re-creates the cardiac cells and mechanical forces of the human heart. A slice of glass, the size of a quarter, tiered with four layers, including real pumping cardiac cells and the sticky fibronectin that gives them shape. It’s not exactly a computer chip, per se, but it’s fabricated in much the same way as the 64-bit A7 chip in an iPhone. “Organs-on-chip” may mean a new testing ground for new drugs, as well as a miniature lab for personalized pharmaceutical testing. Using a technique of converting a patient’s skin cells to stem cells and from there to heart cells, the newly harvested tissue might be tested in a 2.5 cm laboratory similar to McCain’s. Just as diamonds with perfect symmetry may be unusually brilliant jewels, the quantum world has a symmetrical splendor of high scientific value, according to physicists at the National Institute of Standards and Technology (NIST) and the University of Colorado Boulder’s JILA, along with theorists at the University of Innsbruck in Austria and the University of Delaware. Confirming this exotic quantum physics theory, JILA physicists have observed the first direct evidence of symmetry in the magnetic properties—or nuclear spins of atoms. This advance could spin off practical benefits such as the ability to simulate and better understand exotic materials exhibiting phenomena such as superconductivity (electrical flow without resistance) and colossal magneto-resistance (drastic change in electrical flow in the presence of a magnetic field). Illustration of symmetry in the magnetic properties—or nuclear spins—of strontium atoms. 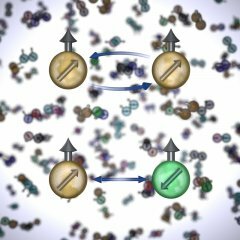 JILA researchers observed that if two atoms have the same nuclear spin state (top), they interact weakly, and the interaction strength does not depend on which of the 10 possible nuclear spin states are involved. If the atoms have different nuclear spin states (bottom), they interact much more strongly, and, again, always with the same strength. The JILA discovery was made possible by the ultra-stable laser used to measure properties of the world’s most precise and stable atomic clock. Spin symmetry has a very strong impact on materials science, as it can give rise to unexpected behaviors in quantum matter, and because their clock is this good (really it’s the laser that’s good), they can probe this interaction and its underlying symmetry, which is at a very small energy scale. The global quest to document quantum symmetry looks at whether key properties remain the same despite various exchanges, rotations or reflections. For example, matter and antimatter demonstrate fundamental symmetry: Antimatter behaves in many respects like normal matter despite having the charges of positrons and electrons reversed, the researchers explained.